Samsung Galaxy S4 Android smartphone with the Snapdragon 600 processor can be updated with the Lollipop 5.0.1 Android OS. This new version of OS can be applied on the I9505 variant of the device and is dubbed as XXUHOD7 version of OS. The best part is that this one comes with the most number of stability fixes. This new update comes with the around 500MB of size and also fixes the RAM consumption as well. This update can be applied to all the Galaxy S4 devices which are not operator locked. So let’s check out on what are the quick pre requisites which you need to follow before we slip on to the detailed guide which will help you update the device. >> It’s always recommended to create a backup of all the data manually with the help of below mentioned steps only and not with the help of KIES. >> Head over to the USB Debugging option via path Settings > Developer Options > USB Debugging to enable the same in your Galaxy S4. Your computer should have full USB Read/Write access and also all required drivers should be installed in your computer so as to transfer the firmware from your computer to the device. >> Make sure that your device is left with the minimum of 50% or else your phone may get turned off in the process of firmware update. Disclaimer: We should not be held responsible / liable in any manner for the damage caused to the device due to not following proper instructions. So let’s proceed to the next step where we have mentioned the detailed instructions which will help you update the device. >> Download Odin and Firmware Zip Package from here to your computer. Once downloaded, you need to now unzip the same to your Desktop. >> Turn off your Galaxy S4 so that it can be entered in the Download Mode. Open Odin in your computer. 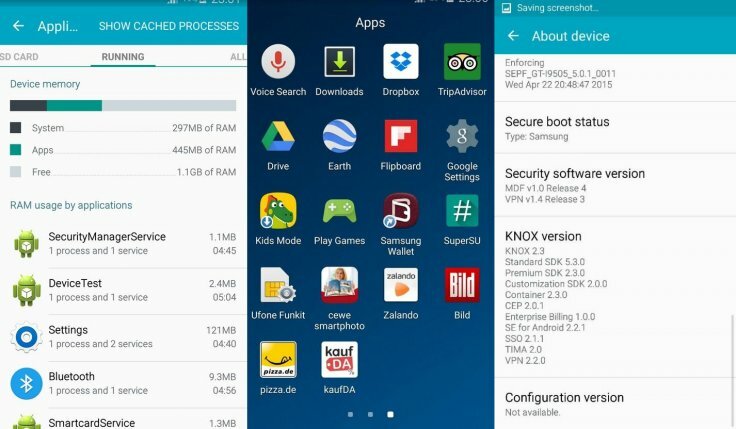 >> Galaxy S5 can be entered into the download mode by holding the Volume Down button + the Home key button (the middle button). While holding these both buttons, you need to switch ON your device. >> In Download Mode, connect your Galaxy S4 to the computer with original USB cable to see that ID:COM turns Blue. >> Click on “AP” to select the firmware file which ends with the .tar file. Once done, you now need to wait for the firmware to be updated. Enable Auto Reboot and F:Reset Time in Odin. Make sure that the Re-Partition option is unchecked. Once done, you need to click on “Start” to start the process of firmware update. >>It will take around 3 -4 minutes for the firmware to get applied in the device. Once its applied, the phone will be rebooted. Once you see the home screen in your device / country selector option, you need to disconnect the device from computer. Note: If your device gets in the boot loop mode, you now need tore follow the above instructions from the start. So there you go, you have successfully learnt on how to update your device with the latest version of Lollipop Android 5.0.1 update. Do let us know in the comments section just in case if you have any issues. Hey guys I’ve got a rooted SGS4 I9505 running stock kitkat touchwiz ROM. Can I still use any of these methods and which would be the best to use?. Thank you. Didn’t work — just sat there saying \Downloading\ on the phone and \Installing NAND\ on Odin. Left it for an hour. Also ensured that there was over 3Gb free space on phone due to file size. What country / region is this firmware for? I’m going to try to upgrade.